- The cod quotas have remained stable, while the quotas on saithe increased a great deal in 2017, which is very likely the main explanation for reduced prices on saithe. A weakened Norwegian krone in 2017 has probably also contributed a little to the increase in value in 2017, while at the same time we see that a weak pound has had consequences in the form of reduced exports to the United Kingdom, says Ingrid Kristine Pettersen, Analyst at the Norwegian Seafood Council. - The quotas on cod and haddock have been reduced in 2018, and there will be major competition for the raw material, which probably will lead to a price increase this year, Pettersen adds. Norway exported 89,158 tonnes of clipfish valued at NOK 4.1 billion in 2017. Measured in volume, this is an increase of 10 per cent, or 8,428 tonnes, and measured in value this is an increase of NOK 344 million, or 9 per cent, from 2016. This is also an increase of NOK 86 million, or 2 per cent, from the previous record year in 2015. Norway exported clipfish from cod valued at NOK 2.4 billion in 2017. The volume was at the same level as in 2016, while the value increased by NOK 167 million, or 7 per cent. Norway exported clipfish from saithe valued at NOK 1.3 billion in 2017. This is an increase of 14 per cent from 2016, which is due to a volume increase of 24 per cent. - The increase in the clipfish exports is because of improvement in important markets. In Brazil, for example, we see that economic optimism is increasing. We see that the prices on clipfish from saithe begin moving upwards here in the last few months of 2017, even though they are lower than in 2016, says Pettersen. In 2017, Norway exported 22,363 tonnes of clipfish to the most important clipfish market, Portugal, at a value of NOK 1.4 billion. This is a reduction in value of NOK 65 million, or 4 per cent, from 2016. Exports of salted fish increased by NOK 67 million from 2016 to nearly NOK 1.3 billion in 2017. The volume has been reduced by 1,093 tonnes, or 4 per cent, to 28,198 tonnes. In particular, there is a volume reduction for whole salted fish from cod. Despite the reduction being greatest for Portugal, this country is still our most important salted fish market. Norway exported stockfish products worth NOK 915 million in 2017. This is an increase of NOK 81 million, or 10 per cent, from 2016. The export value of whole stockfish products was NOK 645 million in 2017, which is a reduction in value of 5 per cent. 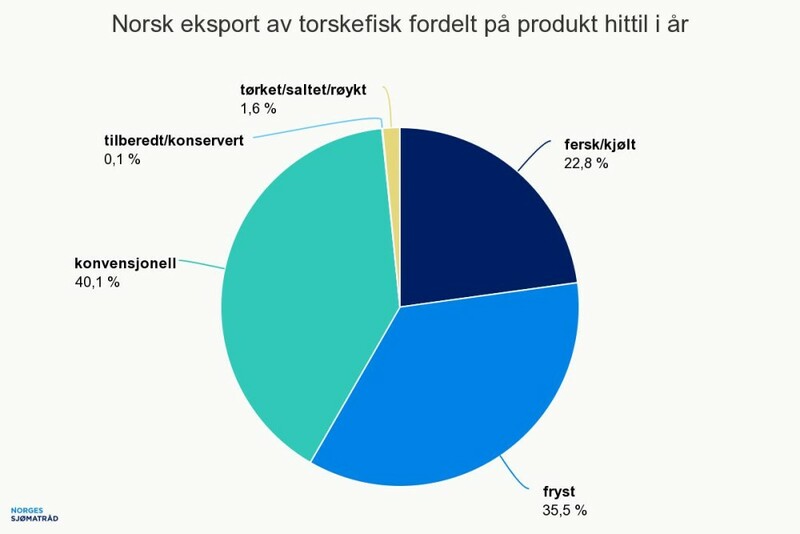 The export value of stockfish fillet products was NOK 37 million in 2017, which is an increase in value of 90 per cent. There was an increase in volume for stockfish heads of 71 per cent to 11,397 tonnes, and an increase in value of 81 per cent to NOK 183 million. Nigeria in particular is responsible for this increase. There is a reduction in exports of whole stockfish from cod, especially to Italy, but also to Nigeria and the U.S. At the same time exports of stockfish heads to Nigeria increased by 79 per cent. For Norway's most important stockfish market, Italy, export value was reduced by NOK 24 million, or 6 per cent, from 2016 because of reduced volumes. One explanation is a warm autumn in Italy, which resulted in the stockfish season starting later than usual. Norway exported 114,283 tonnes of fresh whitefish products worth NOK 3.4 billion in 2017. This is an increase of NOK 392 million, or 7 per cent, from 2016. Norway exported 67,433 tonnes of fresh cod worth NOK 2.3 billion in 2017. This is an increase in volume of 5,067 tonnes and an increase in value of NOK 213 million or 10 per cent compared with 2016. Norway exported 199,731 tonnes of frozen whitefish worth NOK 5.3 billion in 2017. This is an increase in volume of 11,704 tonnes and an increase in value of NOK 427 million or 9 per cent from 2016. Norway exported 84,423 tonnes of frozen cod worth NOK 2.7 billion in 2017. This is a reduction in volume of 2,208 tonnes, while the value has remained stable compared with the same period in 2016. China was the largest market for frozen whitefish in 2017. With an increase in volume of 20 per cent from 2016, exports to China are now just over the record year of 2014, both in volume and value. Norway exported 87,763 tonnes of frozen whitefish to China worth NOK 2 billion in 2017. This is an increase of 20 per cent in volume and 27 per cent in value from 2016. At the same time there has been a reduction in exports of frozen white fish to the United Kingdom of 5,796 tonnes, or 18 per cent. This is due to a decline in both frozen whole haddock and cod. There was a small increase for frozen fillets.